I am so very late to the party with this one that I really can’t think of anything original to say about Charlotte Wood’s The Natural Way of Things. As others have said, it’s a major departure in style from her previous sharp and witty observations of human frailty, and from her focus on characterisation in novels of contemporary realism. The Natural Way of Things is an angry book, with little place for subtle explorations of human frailty. It draws on contemporary events to show how vulnerable women are to misogyny, and it’s unforgiving. I think some of my other blogging friends have reviewed it too, but my searches came up blank. This is a good opportunity to remind readers about Catherine Harris’s terrific book The Family Men in which she tackles the ugly celebrity culture that protects appalling behaviour by high profile sportsmen. It’s a nuanced and all-too-credible treatment of corporate power and the vulnerability of the young women who are its playthings. 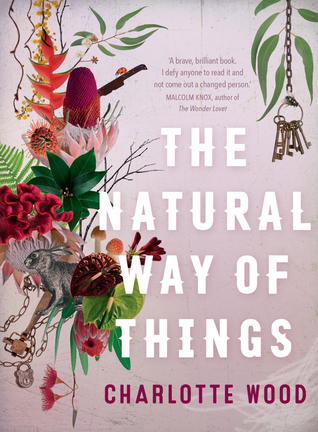 To no one’s surprise, The Natural Way of Things was awarded the 2016 Stella Prize. PS In the wake of the 2015 launch of Change the story: A shared framework for the primary prevention of violence against women and their children in Australia, bloggers like me received a press release asking us to include the following tagline to any relevant coverage of sexual assault, domestic and family violence. Hi Lisa, I too was very disappointed in this book. It was bleak and a flat read. I should have sympathised with the characters but I had no belief in them. Compared to Wood’s other books, it feels like a book written in haste and in anger, one which has appealed to its loudest supporters because of its agenda rather than its intrinsic qualities. IMO Wood has been a better, more nuanced writer than this book suggests. I was encouraged by all the good reviews to buy it and there it sits unread on the TBR shelf. Might now move it over to the books I bought for gifts shelf. I have been looking forward to this one, but it sounds as if I could choose any of her books and be happy. I’ve not heard of her others. On the other hand, I don’t mind bleak subjects, so I’m stil just as curious about this one! Indeed yes, do not let me put you off Wood, her writing can be exquisite and very engaging. Good on her for trying something new, I admire writers who do this, but as MST says below, some of us found this one disappointing. I didn’t enjoy it either, and struggled to finish it. While I completely support the feminist message, this story was too didactic and the characters didn’t come alive for me. I haven’t read enough dystopias really to know, but I think that flat characterisation and stereotyping might go with the genre. But then again, the characterisation in Jane Rawson’s Wrong Turn at the Office of Unmade Lists, and Margaret Atwood’s Handmaid’s Tale defies that. I finished this in the wee hours of this morning. I can’t quite figure out what to make of it but I do keep thinking about it and I think that is a good thing. Perhaps the comment by MST about it being didactic is true to form. Food for thought. I’m now heading off to read some other reviews. *snap* I had it for ages too, and kept putting off reading it too. It was over-hyped from the start. I think you do have to buy into the angst about shaming with this book, and maybe that’s partly what I didn’t like, it felt manipulative, imposing a kind of angry politics on its readers. I am only half way through it and quite puzzled by the accolades it has supposedly received. Keeping an open mind of course and will suspend judgement until the end. It’s quite odd: the longer it’s been since I read it, the more I dislike it. I only seem to remember the tone of angry victimhood, I can’t remember any of the ‘lush prose’ that Kim mentions above. And yet with Wood’s other books, I have fond memories of this or that character or the clever way she skewers contemporary life.